— Over 100 space shuttles will land this November at the Kennedy Space Center, though NASA can take credit for only one. The additional orbiters will be courtesy the Astronaut Scholarship Foundation, which on Thursday formally announced the "Shuttles Orbiting the Space Coast" program, a public art exhibit organized to celebrate the first half-century of U.S. space exploration. "It's appropriate to celebrate NASA's 50th anniversary by showcasing its longest running manned space vehicle -- the space shuttle," said Linn LeBlanc, the Foundation's Executive Director, in an e-mail to collectSPACE. "There were discussions with several of our astronaut members, if the vehicle should be shown in flight or fully-stacked, but it was unanimously decided to show the orbiter in all its glory -- in flight!" 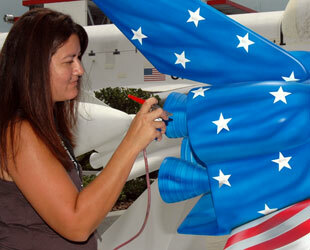 LeBlanc, as well as several of the Foundation's astronaut board members and representatives of Florida's Space Coast Office of Tourism were at Kennedy Space Center's Visitor Complex yesterday to reveal the 8-foot tall shuttle statues, including the first to be painted by Quiet Flight surfboard artist Gina Razzano. Her design for the formerly all-white orbiter incorporated the U.S. flag, an American bald eagle and the Moon. Other artists can apply through June 30 to take part in the program and if selected will be given six weeks to paint their design and a $1,000 honorarium in return. Beginning on November 7 for one month, the 100 decorated shuttles will be displayed at the visitor complex for public viewing. Designed as a fundraiser for the Foundation, which offers scholarships to college students excelling in science and engineering degrees, the shuttles are to be sponsored by companies and organizations in return for the opportunity to display them elsewhere around Brevard County and the nation. Sponsorship levels span $2,800 to $20,000. "There are currently nine leading sponsors who signed on immediately -- Kennedy Space Center Visitor Complex, Florida's Space Coast Office of Tourism, Florida Today, Lockheed Martin, The Boeing Company, Courtyard by Marriott Cocoa Beach, Sunward Tours, Communications Concepts Inc. and ITT Corporation," explained LeBlanc. 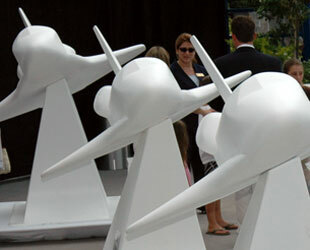 From December through June 2009, the fiberglas orbiters will go on display at sponsors' chosen locations. For the higher level participants, astronauts will accompany their shuttle statues for an unveiling ceremony. Then in July of next year, the shuttles will return to KSC for one last public display before they go separate ways. 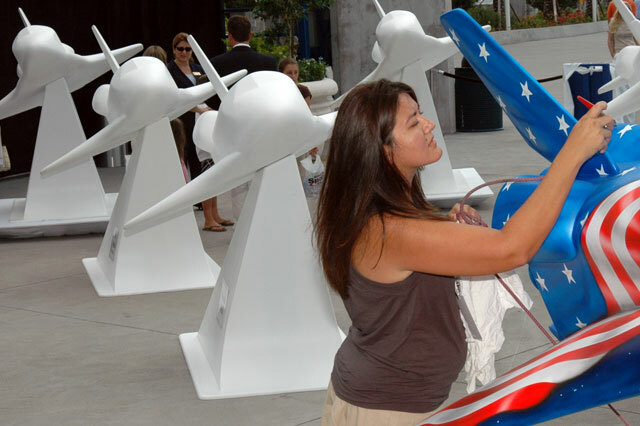 "Some of the space shuttle statues will be donated to schools and public venues, while others will be auctioned for charity," shared LeBlanc, who added that all proceeds will benefit the Foundation. A "Final Destination" dinner will be held in August 2009 to sell the remaining statues. 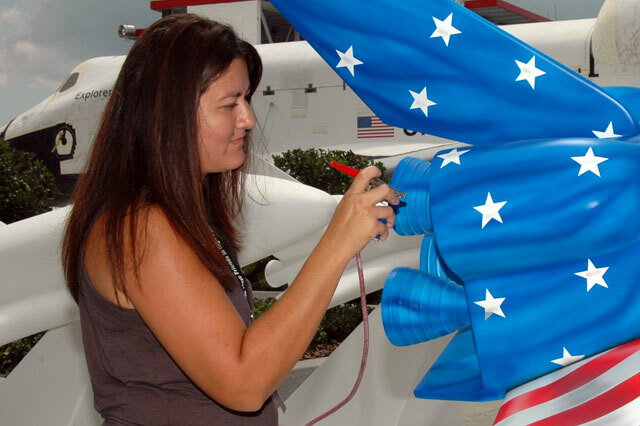 The "Shuttles Orbiting the Space Coast" follows previous public art statue programs including those in the shape of cows, pandas, Walt Disney's Mickey Mouse and Charles Schulz' Snoopy. "Little did we know how all-encompassing it would be -- from developing a mold to manufacturing the statues -- it's been a magnificent ride and we are so excited to be a part of Brevard County's first ever statue art program," said LeBlanc.